My sandwich conundrum changed, however, when I first made a Fuel Pull copy-cat version of Swiss Chalet’s famous sauce. American friends, Swiss Chalet is a Canadian restaurant chain that specializes in rotisserie chicken and all its variations…similar to Chick-Fil-A, I would guess. Recently, I made the sauce a little thicker by whisking in a little more xanthum gum. This turned out to be the perfect condiment for an E sandwich! It’s absolutely loaded with flavor, and because it’s a Fuel Pull, you can be as generous with it as you want! Now I can douse my sprouted bread with moisture in still stay in an E setting. One batch of sauce provides one week of amazing sandwiches and makes it so easy to get in an E a day. Spread one slice of sprouted bread with Laughing Cow wedge. 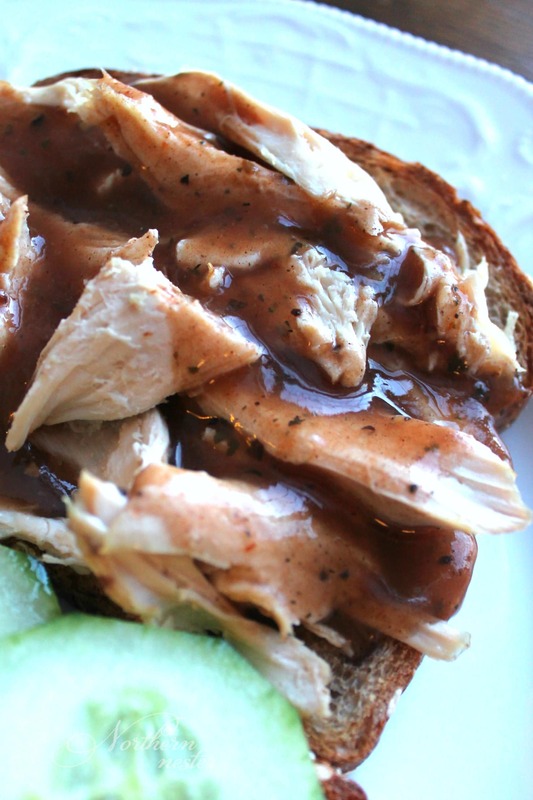 Arrange shredded, cooked chicken breast on the other slice and pour copy-cat Swiss Chalet sauce over top. Heat in oven or toaster oven at 350 F for 5-7 minutes, or until cheese is melted and chicken is heated through. Place cucumber slices, lettuce, mustard and tomato slices over top of the chicken slice and top with toasted Laughing Cow slice. 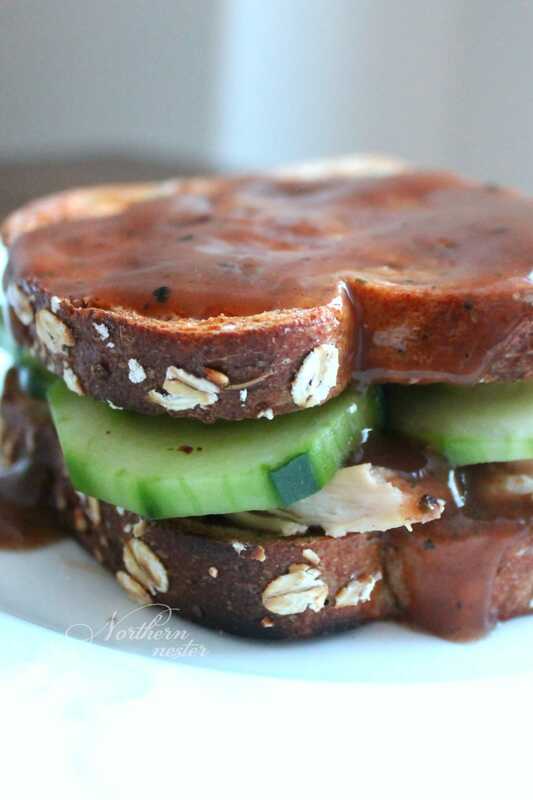 Pour more Swiss Chalet sauce over top of the entire sandwich, if desired, and enjoy immediately! 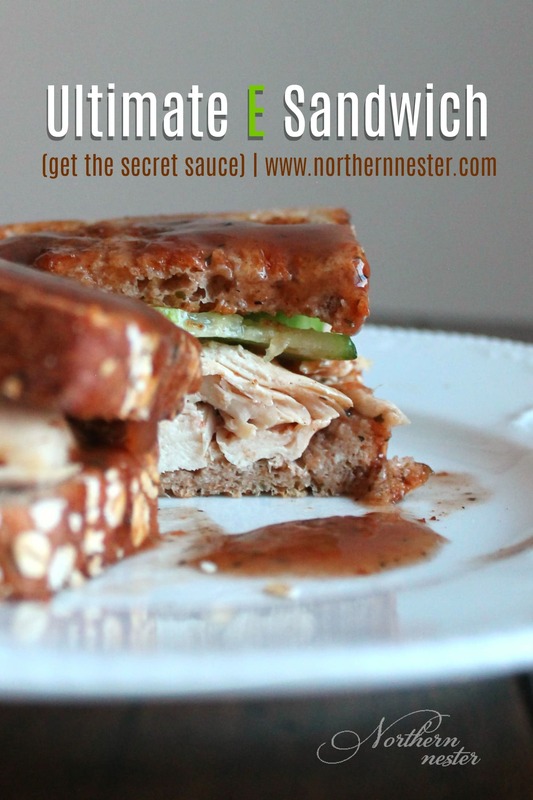 You can get the “secret sauce” right here: Copy-cat Swiss Chalet Sauce. Sounds delicious! What kind of chicken broth do you use? Or do you always make your own bone broth? I don’t ways make my own. Sometimes I use President’s Organic Chicken broth in a carton or even boullion powder mixed with water, but that stuff often has off-plan ingredients. What else would you eat with this? Or is this complete meal? This is a complete meal, but you can always pair it with an E or FP shake or smoothie if you’re ravenous! I don’t see pickles on any THM recipes. Are they a no no? That’s a great question. I hadn’t noticed until I read your comment. I don’t see why they would be okay? Just cucumbers, salt, and vinegar basically.